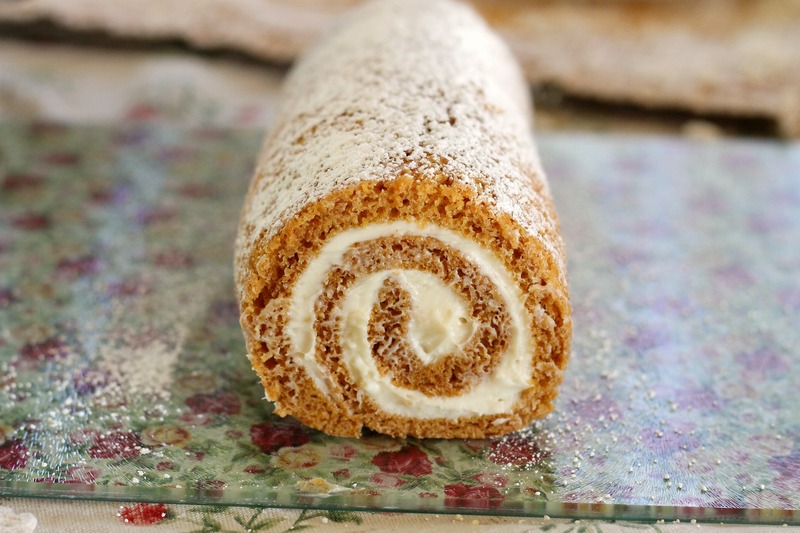 Pumpkin roll is something that we’ve enjoyed for many years. Our grandparents used to own a home in Central Pennsylvania, and our Grandmom used to buy pumpkin rolls from an Amish farmer’s market that was located nearby. Also, a good family friend of ours who babysat for us when we were little often brought a delicious homemade pumpkin roll over on special occasions and holidays. We both can agree that pumpkin roll is one of our favorite desserts, because of its sentimental value and delicious taste. It’s extremely simple to make, which is a nice bonus. The cake literally takes under ten minutes to whip up, fifteen minutes to cook, and an hour to cool. 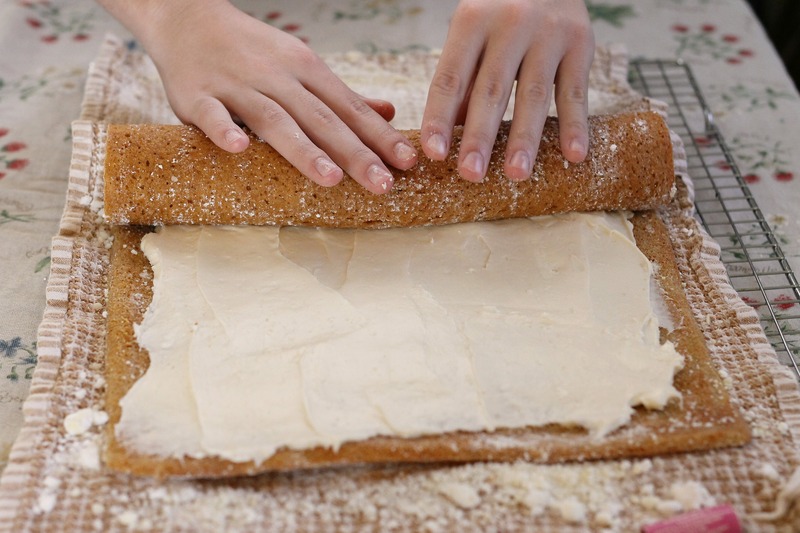 All that’s needed is a super quick cream cheese filling and a quick roll-up and it’s done! We served ours with a scoop of Trader Joe’s Pecan Pie Ice Cream (tasty, but probably not as good as a homemade variety that we are now inspired to make. 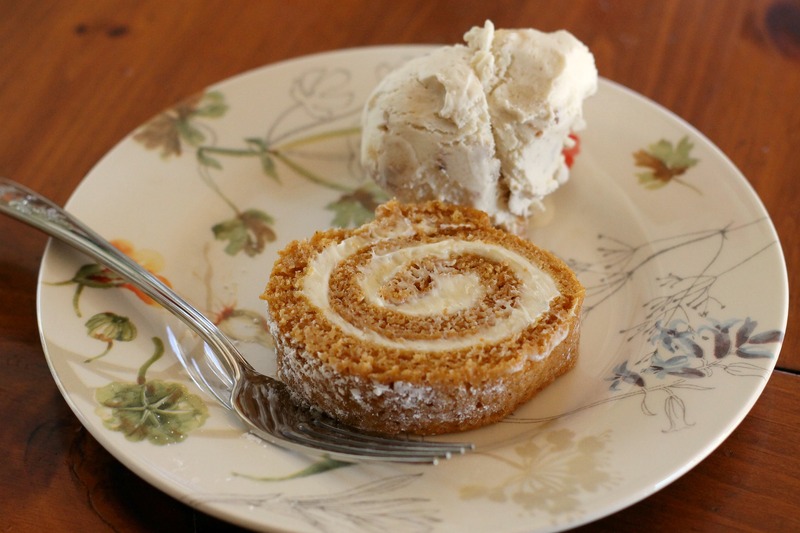 Plus, the pumpkin roll was way better than the ice cream) and it made for a tasty treat. This is an ideal Thanksgiving dessert, mostly because it’s easy to make (it can be made in advance and frozen, then thawed before serving) and incorporates the lovely fall flavors of pumpkin and spices. And who can resist the cream cheese filling? P.S. Tomorrow we’ll be sharing a healthier but also very tasty Thanksgiving side dish, so don’t complete your menu until you see it! P.P.S. Grandmom and Pop, if you’re reading this, we have two slices of pumpkin roll in the freezer for you! Combine flour, baking powder, baking soda, cinnamon, cloves and salt in small bowl. Beat eggs and granulated sugar in large mixer bowl until thick. Beat in pumpkin. Stir in flour mixture. Spread evenly into prepared pan. Sprinkle with nuts if using.